I decided to show off the ever beautiful Zoya PixieDust Tomoko from the Fall 2013 collection. I remember when I first learned texture polishes like this were going to be released. I was not excited. Texture? Roughness? On my nails? No thank you. And now? I can't believe there was ever a time when PixieDust didn't exist. I really adore it. And it's super conducive to nail art which is always a plus in my book. I have on two coats here. 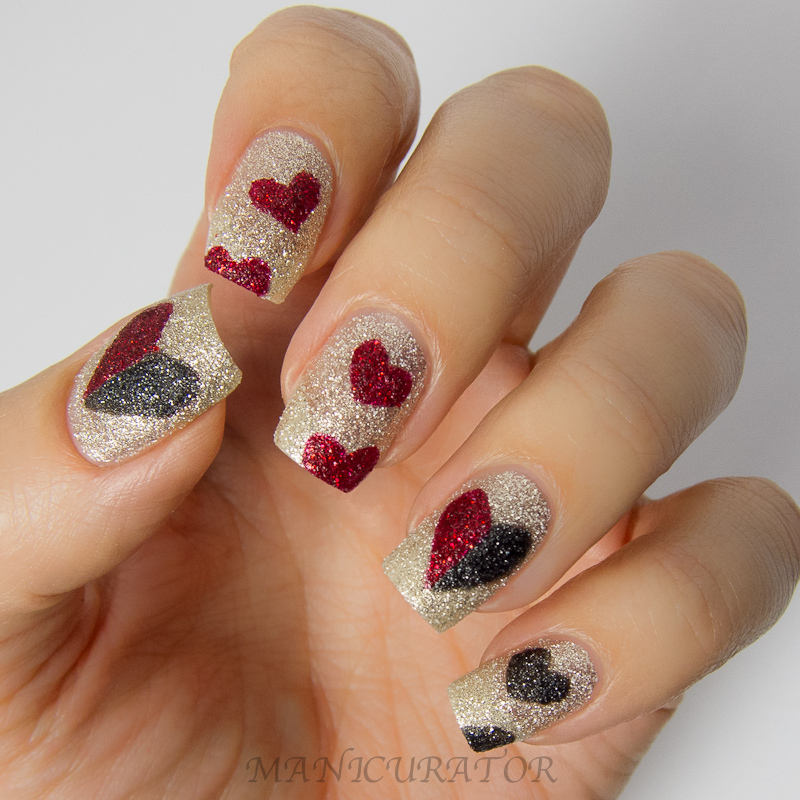 I interpreted our Digit-al Dozen Love and Heartbreak theme with red hearts of love with Zoya PixieDust Chyna, black heartbreak hearts with Zoya PixieDust Dahlia and confusion, literally love and heartbreak together with the red and black nails. OK, are you ready for this?? I did all of these hearts free hand! I'm surprised too! Haaha! I am ready to say that my free hand skills have become..quite good. I'm really proud of myself. I love love this manicure. It's so sparkly in real life, the camera can't capture it completely. What do you think? Are you a PixieDust fan like I am? Hope you had a great weekend! I'm excited and nervous, my boys have their first day of pre-k tomorrow! Wish us luck :D I wonder who will cry more, them or me.. This is very cute! Love it! I love this! The red hearts against the glitter base coat is beautiful! very nice polish! very beautiful heart! Free hand?!.. Wow! Really good job! Your manicure is gorgeous! I love it! And yes, I am too a Pixie Dust Fan :D.
I haven't really liked textured polishes until I saw this mani. They look so amazing! This is really beautiful. I love how the red looks over Tomoko! Beautiful! Absolutely love these nails. I must get my hands on these zoyas! i love it! i wish i could draw on textures, i cant even stamp on them! this is so beautiful! I love all your textured nail art!